No. 19 Texas (4-1, 2-0 Big 12) vs. No. 7 Oklahoma (5-0, 2-0). For the first time since 2012, the Longhorns and Sooners are both ranked for their annual matchup at the State Fair of Texas where the crowd splits 50-50 in burnt orange and crimson. 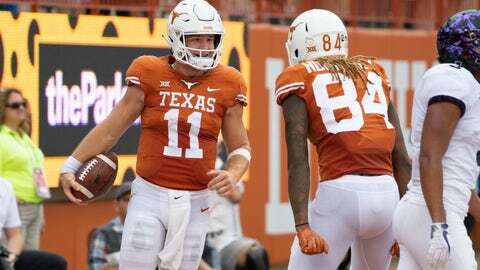 Quarterback Sam Ehlinger hasn’t thrown an interception in the past month during the first four-game winning streak for the Longhorns since 2013. Kyler Murray threw for a career-high 432 yards with six TDs and also ran for a score when the three-time defending Big 12 champion Sooners beat Baylor last weekend for their 26th win in 27 Big 12 regular season games since a 2015 loss in the Red River rivalry. Iowa State defense vs. Oklahoma State offense. Even with a fifth-year senior and first-time starting quarterback Taylor Cornelius, the Cowboys have one of the Big 12’s best offenses with 545 total yards per game (league-best 231 yards rushing and 314 yards passing) and 44.4 points per game. The stingy Cyclones have allowed only 333 yards and 20 points a game, though their offense averages league-worst totals of 300 yards and 18 points a game. Baylor is perfect scoring in the red zone, with 14 touchdowns and four field goals on 18 possessions inside the 20. The Bears‘ 78-percent TD rate in the red zone is much better than their 2017 mark of 45 percent (18 TDs on 31 red-zone trips). … Kansas State has held three consecutive opponents without a rushing touchdown for the first time since 2014. … Iowa State has lost six in a row in its series against Oklahoma State since a 37-31 double-overtime win in 2011, but the last three games have been decided by seven points or less. … Texas has a 61-46-5 series lead against Oklahoma, the only Big 12 team to hold an all-time series lead over the Sooners. Kansas (2-3. 0-2) is a four-touchdown underdog heading to No. 9 West Virginia (4-0, 2-0). The Jayhawks last month ended a 46-game road losing streak that dated to 2011 and won consecutive games for the first time in 2009, but are 0-2 in Big 12 play. They have lost 12 conference games in a row and 62 of 65 since the league went to 10 teams in 2011. That includes a 1-6 mark against the Mountaineers, whose series wins have been by an average margin of 31 points. Kansas has lost 41 consecutive Big 12 road games over the past 10 years. Oklahoma State junior defensive end Jordan Brailford is the Big 12 leader with seven sacks, twice as many as any other player. He had three last week against Kansas, the fourth time in five games this season he has recorded a sack. His 1.4 sacks per game is second nationally.